With its dazzling red plumage, conspicuous crest and enticing whistles, the male Northern cardinal is so distinctive it probably needs no introduction. Validating its popularity, seven states claim this songbird as their state bird. No other bird garners such prestige. If you live in cardinal range, you can all but count on attracting them to your feeder with their favorite foods, especially sunflower seeds. And since they're not migratory, once you entice cardinals to your feeder, it’s probable they’ll stay year-round. Once limited to the Southeast, Northern cardinals can be found across the eastern two-thirds of the lower 48 states, as well as parts of New Mexico, Arizona and California. Cardinals feed on a wide variety of seeds, berries and insects. Naturally, they forage on the ground or from low branches, but have adapted well to meals supplied at bird feeders. In a three-year study of seed and feeder use, project lead David Horn of Millikin University in Decatur, Illinois, reported cardinals were the sixth most common bird found at feeders. Based on the more than 54,000 feeder visits recorded, cardinals -- which were most abundant in the fall and winter months -- overwhelmingly preferred black-oil and striped sunflower seeds and safflower seeds. Millett and corn products were consumed but with a lower preference. These results have been confirmed by the more than 20,000 citizen-scientists participating in Cornell’s ProjectFeeder Watch, an ongoing winter-survey of birds that visit feeders across North America. Besides reporting on what they like to it, participants also report on where they like to eat it: Cardinals feed off the ground or use large hoppers, platform feeders or large tube feeders. The cardinal's extraordinary red plumage comes from pigments called carotenoids. Animals can’t synthesize these pigments, so they must acquire them from their food. If you want to turn up the dial on your cardinals’ color -- not to mention attract more birds to your backyard -- plant shrubs and foliage that produce fruits high in dietary carotenoids. Generally speaking, those with more colorful berries tend to pack more punch, including Streptopus, Rosa glauca and Polygonatum. 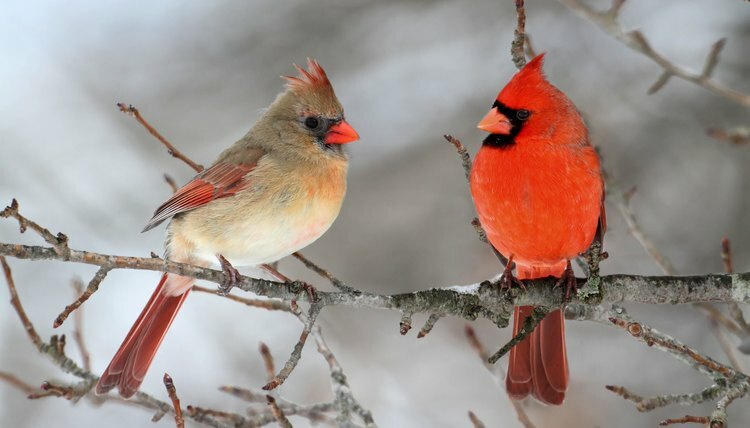 Higher levels of red pigments also have been shown to help male cardinals with the ladies. According to results of a three-year field study reported in Behavioral Ecology, redder males secured the best females within the best territories. As a result, redder males produced more offspring during the breeding season. Shelter For roosting and nesting, cardinals require trees, shrubs, thickets and vines. They're not cavity nesters, so they'll almost never use birdhouses. Rather, they build open-cup nests in vegetation that offers concealment. Though it’s not entirely clear why, native shrubs have been shown to offer better nest protection. One study found cardinal nests in exotic shrubs were twice as likely to fail as those in natives. The Cornell Lab of Ornithology recommends flowering dogwood, serviceberry, wild grape, Virginia creeper and staghorn among others. Besides providing spots for nesting, they offer protection from the elements and predators, as well as summer and fall fruits and seeds. Water Cardinals seek out clean, fresh water for drinking and bathing, so be sure to incorporate a water feature such as a bird bath or pond into your backyard plans. Like other songbirds, they seems to prefer water at ground level, so place bird baths on or close to the ground, preferably in the shade and near shrubs for a quick getaway. Add stones or branches to allow birds to drink without getting wet. Moving water really seems to draw their attention, so add a dripper or fountain to get even more bang for your buck. Collisions: The American Bird Conservancy estimates that 300 million to 1 billion birds die each year from collisions with glass in buildings. Birds can’t differentiate reflections in glass from reality. Take steps to protect birds from your windows, particularly during migration periods or when young are leaving their nests. Move houseplants away from windows, reduce outdoor light use and apply products such as ABC BirdTape to break up reflections. Predators: Shrubby vegetation and thickets provide cover for birds to avoid predators such as raccoons, hawks and cats. If you thought the death toll from window collisions was high, wrap your mind around this: A 2013-published study in Nature Communications found free-roaming domestic cats kills an estimated 1.3 to 4.0 billion birds annually in the lower 48 states. That’s more than the population of China. If you love your cats, and you care about birds and other wildlife, keep your cats indoors.